❥ Synopsis: Chatty watercolorist shares an art studio with a reluctant moody musician and painter of skulls. In this classic tale of opposites attract, we meet Janie Drago and Falquen Forrester. Falquen is a moody Goth bass player for local band, These Bones. Besides being a brilliant musician, he is also an up and coming painter with eccentric tastes. He lives alone in his art studio above an artist’s supply shop, The Crypt. Needing a little extra cash, he very reluctantly takes out an ad, renting out the spare room in his apartment. Janie is a fresh out of art college, watercolorist. She paints happy pictures of gardens and kittens. She’s hoping to dive in head first into Toronto’s art circuit and make a name for herself. To do that, she moves out of her childhood home in the suburbs to find a place in the city. After a few failed attempts, Janie’s search for a place of her own has gotten desperate. What happens when fate brings these two polar opposites together? AN AWESOME READ – This was another satisfying read from this writer. The characters are fascinating in and of themselves but the sweet and loving romance catches you right from the start. You can’t help but cheer Falquen and Janie on as they inevitably encounter the societal snubs of the “normals” of which Janie is one. 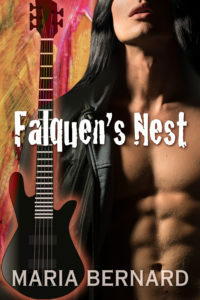 Falquen is Goth and worries that Janie’s parents will become estranged because of it. I have to admit a societal image of Goth people has gripped me in the past but seen through the eyes of Maria Bernard I am happily becoming a fan! Especially with such rich characters as Falquen, his twin Gray, and Sage from the previous book. PURCHASE AND READ WITH PLEASURE. Five Stars – Good story. Loved the characters. Can’t wait to read the rest of the series. Well worth it! – Ok I have to confess, I am about as far from Goth as I can get. But I love rock stars. I am so freaking glad I bought this book! Falquen has advertised a room for rent in a half hearted attempt to find a roommate. Falquen is a bassist in a band, an artist who paints skulls and loves the dark. He also owns the art supply store below his apartment. Janie is an art school grad who is afraid of the dark, paints kitten and flowers with water color and is desperate to move out of her friend’s house. Boy meet girl. The beauty of this gem of a novel is how the author captures the emotions of the characters. The characters are written in such a way that you want to be part of their world. You want to be Janie not just read about her. You want to know Falquen’s back story. The author doesn’t have to tell you that Falquen is sad or mad or frustrated, the reader already knows or feels it because the author developed the characters so well. I loved it. And don’t get me started on the secondary characters. I want to know every single one of their stories. And let me tell you how refreshing it is read and a real guy not some overbearing unrealistic unobtainable alpha. But don’t get me wrong, Falquen has some fantastic alpha traits. All I can say is stop being so mainstream and give these Gothstars a try.